East meets West in this tasty fusion combo. 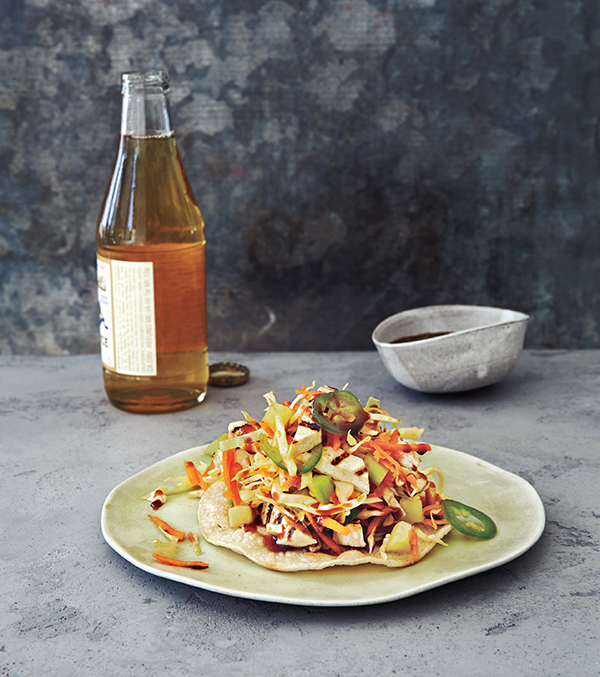 Tostada means “toasted” in Spanish and is the name of a Mexican dish in which a toasted tortilla is the base for other ingredients that top it. Bánh mì is a popular Vietnamese sandwich that features crisp pickled vegetables, fragrant cilantro, chiles, and zesty hoisin and sriracha sauces. 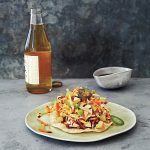 In this iteration, bánh mì ingredients find themselves on toasted tortillas instead of in a baguette to make Bánh Mì Tostadas. Corn tortillas are usually used for tostadas, although wheat tortillas may be used if you prefer. In a large bowl, combine the carrot, cucumber, cabbage, cilantro, and jalapeños, if using. Drizzle on the sesame oil and toss gently to combine. Set aside. Heat the vegetable oil in a skillet over medium heat. Add the garlic, scallions, and ginger and cook for 1 minute. Add the tofu and 1 tablespoon of the soy sauce and mix well to coat the tofu. Set aside to cool. In a small bowl, combine the remaining 2 tablespoons soy sauce, the hoisin, vinegar, sriracha, and sugar, stirring well to blend. Preheat the oven to 400°F. Arrange the tortillas in a single layer on two baking sheets. Brush both sides of each tortilla with oil. Bake for 5 minutes on one side, then flip the tortillas over and bake for 2 to 3 minutes longer, until crispy. Watch carefully so they don’t burn. Evenly divide the tofu among the tostada shells. Top each with some of the vegetable mixture, then the sauce. Serve immediately. Excerpted from 100 BEST VEGAN RECIPES, © 2016 by Robin Robertson. Reproduced by permission of Houghton Mifflin Harcourt. All rights reserved. Photo by Lucy Schaeffer. Robin, these look so tasty, but how does one eat a tostada? Tostadas are as tasty as they are messy to eat! They can be eaten by just breaking off a piece at a time with your hand or you can use a knife and fork to cut it. Hi Robin, This looks and sounds so good. I could eat it for breakfast!